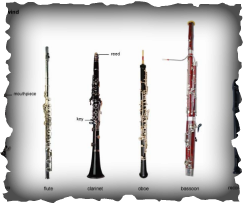 The woodwind family of instruments includes, from the highest sounding instruments to the lowest, the piccolo, flute, oboe, English horn, clarinet, E-flat clarinet, bass clarinet, bassoon and contrabassoon. Woodwind instruments are a family of musical instruments within the more general category of wind instruments. There are two main types of woodwind instruments: flutes and reed instruments (otherwise called reed pipes). Metal caps called keys cover the holes of most woodwind instruments. The mouthpieces for some woodwinds, including the clarinet, oboe and bassoon, use a thin piece of wood called a reed, which vibrates when you blow across it. Want to know who teaches wind lessons at the Gray School of Music? All you need to do is click here. The best thing about learning how to play a wind instrument is the added health benefit. Playing a Wind Instrument takes a lot of air movement to create the ideal tone production. Breathing like this helps get more oxygen to the blood. Being a musician makes you smarter and better at test taking. Practicing a musical instrument is a great way to relieve stress. ​Interested in learning to play or improve you skill set with the wind instruments? Call us today @ (310) 832-0519 or use the form fill located on the Sign Up Today ​Page and schedule a lesson. The Gray School of Music has been teaching the wind instruments to students will all skill sets in the San Pedro and Rancho Palos Verdes area for decades. We have been a family owned and operated business since 1950.